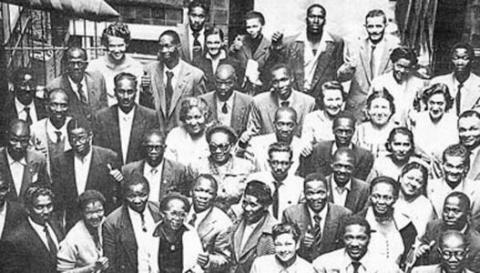 Formation of the Industrial and Commercial Workers Union of Africa (ICU). Introduction of Industrial Conciliation Act. Formation of the Council of Non-European Trade Unions (Transvaal) (CNETU). Formation of the African Mine Workers Union. Food and Canning workers Union is formed. August, African Mine Workers strike. Rise of the Nationalist Party to state power. Introduction of the Suppression of Communism Act. Defiance Campaign Against Unjust Laws. Bettie Du Toit is banned for carrying out an act of communism. 55 000 workers join South African Congress of Trade Unions (SACTU). Introduction of the Native Labour (Settlement of Disputes) Act. Becky Lan, General Secretary of the Food and Canning workers union is banned for two years for attending a communist gathering. September, Ray Alexander is ordered to resign from her position as General Secretary of the Food and Canning Workers Union (FCWU) and is prohibited from attending any gatherings of any nature in two years. October, Dissolution of the South African Trades & Labour Council (SAT & LC). South African Congress of Trade Unions (SACTU) becomes a member of the member of the Congress Alliance, consisting of organisations such as the African National Congress (ANC), South African Indian Congress (SAIC), South African Coloured People's Congress (SACPC), and South African Congress of Democrats (SACOD). African Congress of Trade Unions (SACTU). South African Congress of Trade Unions (SACTU) launches its paper, Workers Unity. South African Congress of Trade Unions (SACTU) operates on a shoestring budget, with an affiliation fee of 10 shilling per union, plus 1d. per member per month in order to organise grassroots structures effectively. South African Railway and Harbours workers union, under the able leadership of Lawrence Ndzanga, affiliates to South African Congress of Trade Unions (SACTU). Kimberley's Garment Workers Union is formed by J Mampies, independent of any South African Congress of Trade Unions (SACTU) Local Committee. South African Congress of Trade Unions (SACTU) and its affiliates continue to encourage African workers to boycott the machinery of the Native Labour Act. Lucy Mvubelo breaks ties with South African Congress of Trade Unions (SACTU) and joins the reformist camp of the SATUC-FOFATUSA. 5 March - 6 March, South African Congress of Trade Unions (SACTU) is founded at an inaugural conference in Johannesburg. 13 April, Seconded by Cleopas Sibande, Lucy Mvubelo, South African Congress of Trade Unions (SACTU), Vice-President proposes that the South African Congress of Trade Unions (SACTU) and the secretary should enquire about the affiliation fees. May, The formation of South African Congress of Trade Unions (SACTU) is strengthened by the principled decision of the CNETU to dissolve and in turn merge with the new non-racial trade union, South African Congress of Trade Unions (SACTU. Durban South African Congress of Trade Unions (SACTU) local Committee is formed and the leaders elected to take responsibility are Billy Nair, as secretary, and Stephen Dlamini as chairman. June, Congress of the People (Kliptown). South African Congress of Trade Unions (SACTU) management Committee sends a letter to the Trade Union Congress (TUC) executive, urging maximum co-operation and unity in opposing apartheid legislation. October, The executive of the Transvaal Metal Workers Union (MWU) requests that South African Congress of Trade Unions (SACTU)'s first national organiser, John Nkadimeng, be permitted to work full-time for their union. Introduction of Industrial Conciliation Act 1956. South African Congress of Trade Unions (SACTU) membership total is estimated at 20 000. After an intensive organising campaign amongst Port Elizabeth dockworkers by Alven Bennie and Vuyisile Mini, the Port Elizabeth dockworkers union affiliates to South African Congress of Trade Unions (SACTU). Alven Bennie is asked by South African Congress of Trade Unions (SACTU) executive members Leslie Massina and Mark Shope to begin organising the unorganised structures of the union. March, South African Congress of Trade Unions (SACTU)'s first annual national conference, the president in his address to the delegates reiterates the union's position: while the South African Congress of the Trade Unions (SACTU) must thus pursue an independent policy in the interests of the workers, it must also participate unreservedly in the struggle to mobilise the people behind their demands as embodied in the Freedom Charter and must cooperate with all other organisations engaged in this struggle. Garment workers union of African women affiliates to South African Congress of Trade Unions (SACTU) with a membership strength of 400. Viola Hashe becomes the first women leader of an all male union in South Africa. May, A national South African Congress of Trade Unions (SACTU) school is convened, where unions send younger workers and potential organisers to study this series of lectures and listen to the experiences of veteran trade unionists: among the lecturers are Eli Weinberg, Ray Alexander, L. Friedman, John Nkadimeng and Leon Levy. 9 August, The campaign, spearheaded by the FSAW with the assistance from the African National Congress (ANC) Women's League and South African Congress of Trade Unions (SACTU), steadily gains momentum and culminate in a mass demonstration in Pretoria. December, Ben Turok, secretary of the South African Congress of Trade Unions (SACTU) is arrested for High Treason, his wife replaces him as the secretary and in this way the union maintains continuity. Billy Nair and Stephen Dlamini are arrested and among the 156 Treason Trialists. The 1-pound a day campaign is regarded as South African Congress of Trade Unions (SACTU)'s most successful achievement. Lucy Mvubelo joins South African Congress of Trade Unions (SACTU). Moses Mabhida is elected South African Congress of Trade Unions (SACTU) Vice-President. 7 January, Beginning of Alexandra Bus Boycott. 4 March, South African Congress of Trade Unions (SACTU) militant leaders like Vuyisile Mini, Caleb Mayekiso and Alven Bennie lead the campaign to support the harbour workers within the South African Congress of Trade Unions (SACTU) Local Committee. SACTU appeals to the international working class to denounce the use of convict labour and the ICFTU takes the lead in issuing a warning to the South African regime. 12 April, South African Congress of Trade Unions (SACTU) holds its second annual conference; the meeting is opened by Ben January. June, During Sir Thomas O'Brien and P.H. de Jonge's tour in South Africa, representing the ICFTU, South African Congress of Trade Unions (SACTU) presents them with a memorandum stating its desire to co-operate with both international federations in creating a united action against apartheid. July, Asinamali (We have no money) Rally held in Johannesburg, the fifth of its kind throughout the country, draws 500 workers from Klerksdorp, Pretoria, Johannesburg, the East and West Rand, representing 60 000 workers in total. South African Congress of Trade Unions (SACTU) claims that not a single bona fide African trade union has agreed to work within the machinery of the Native Labour Act. Leon Levy delivers a presidential speech at the South African Congress of Trade Unions (SACTU) conference stating his organisation's position as follows: Our efforts in the past have been rebuffed. The SATUC has refused to join with us in action ..., as a result, many of our affiliated unions have hardened in their attitude toward having any dealings with this body, but we cannot agree with them. The struggles of the workers require unity of all workers ... No matter how often our overtures are rejected, we must look for ways of establishing our ideal-unity. 14 April - 16 April, National Stay-At-Home. South African Congress of Trade Unions (SACTU) calls for an end to the state controlled Wage Boards and their replacement by a national, legislated minimum wage for all workers of 1 pound a day. Federation of free African Trade Unions of South Africa (FOFATUSA) is formed. A closer working relationship between South African Congress of Trade Unions (SACTU) and the African National Congress (ANC) is forged, with both recognising the urgent necessity of organising workers and peasants into their respective organisations. South African Congress of Trade Unions (SACTU) conference extends the NOC structure to include the mining and agricultural workers. South African Congress of Trade Unions (SACTU) receives a hand-written letter stating that a union official has been arrested and shop stewards are prevented from collecting subs from workers, and a third attempt to organise milling workers is promised. Chief Albert Luthuli is the guest speaker at the South African Congress of Trade Unions (SACTU) conference. South African Congress of Trade Unions (SACTU) condemns the death of political detainees near Saigon and calls for the independence of the South Vietnamese people from imperialism. ICFTU offers its support South African Congress of Trade Unions (SACTU), both politically and financially, on condition that first South African Congress of Trade Unions (SACTU) agree to sever all ties with the Congress Alliance, and second, that South African Congress of Trade Unions (SACTU) divorce its economic and political struggle, that is, reject the goal of liberation and embrace the reformist ends. Durban South African Congress of Trade Unions (SACTU) membership increases by over 5 000 members. 28 February, South African Congress of Trade Unions (SACTU) calls for a national workers conference to be held in all major centres. The response throughout the country was one of the greatest ever to a South African Congress of Trade Unions (SACTU) campaign for an end to poverty wages and political oppression. 31 May, Beginning of Potato Boycott. 18 June, 2 000 Cato Manor women gather to convey their grievances to a local official. The response is vicious. Police wielding batons strike down hundreds of women and children. They are protesting against Beer-Halls and Dipping Tanks. The law prevents Africans from having their own liquor at home, but encourages them to go to municipal Beer-Halls to drink “Bantu Beer” provided there. The militant women of Natal call for a total boycott of the beer halls. South African Congress of Trade Unions (SACTU) women leaders such as Dorothy Nyembe, Florence Mkize and Gladys Manzi inspire the women who carry out an intense campaign by picketing the Beer Halls in a number of municipalities. 26 June, The Congress Alliance calls a national boycott of all the nationalist products such as Rembrandt. October, Formation of the Federation of Free African Trade Unions of South Africa (FOFATUSA). November, Formation of the All-African Trade Union Federation (AATUF). Arnold Selby, national organiser for the Sweet Distributive and Textile workers union, flees South Africa after the state of emergency and continues to assist South African Congress of Trade Unions (SACTU) in international solidarity work. Trade Unions Congress (TUC)'s regard for African workers reaches all time low, when it refuses to assist South African Congress of Trade Unions (SACTU) in its campaign for adequate compensation for the victims of the Clydesdale mining disaster. Moses Mabhida, South African Congress of Trade Unions (SACTU) chairman, flees South Africa. The State of Emergency is declared and a three months ban on South African Congress of Trade Unions (SACTU) meetings is declared. March - April, Nation-wide strikes in response to banning of the ANC. 30 March, Unlawful Organizations Act used to ban the African National Congress (ANC) and Pan-Africanist Congress (PAC). December, South African Congress of Trade Unions (SACTU) delegates to the International Labour Organisation conference in Lagos, Nigeria, are denied permits to travel and have to withdraw from the conference. Memory Vakalisa is elected secretary of the African Municipal Workers Union (AMWU). South African Congress of Trade Unions (SACTU)'s 13 page memorandum to the 45th International Labour Organisation in a strongly worded document which, in addition to briefing the international community on housing conditions, employment practices for Black workers in South Africa, takes exception to the SATUC 1960 claim of multi-racial status. 10 January, 194 workers inform management that if their demands are not met, single-decker buses would remain at the depot and double-deckers would go slow. 29 March, The acquittal and the release of Treason Trialists, after four years of harassment, is not a victory for the defendants only, but also for the oppressed people of South Africa and South African Congress of Trade Unions (SACTU). April, South African Congress of Trade Unions (SACTU)'s paper Workers Unity, issues a special supplement endorsing support from national and international bodies on a non-partisan basis, independent of international affiliation. May, Vuyisile Mini and Alven Bennie are arrested for their involvement in an important Bay Transport Company strike in Port Elizabeth. 29 May - 31 May, National Stay-At-Home. June, Billy Nair is arrested and charged with incitement to strike during the May Stay-At-Home, three hours after he is given a five-year banning order preventing his movement outside Durban magisterial district and prohibiting him to enter a factory, African location, hostel or village. December, A raid on the South African Railway and Harbour Workers Union's office results in the seizure of individual membership cards and subsequent intimidation of members through threats of dismissal and actual transfers to lower paying jobs. Introduction of the Sabotage Act. South African Congress of Trade Unions (SACTU) is forced to convert its activities to the conditions of underground work, and continues to spearhead the workers' struggle. South African Congress of Trade Unions (SACTU) conference welcomes the FPAWU as the first organised affiliate representing African farm workers. From a four-page format in the early years, Workers Unity, South African Congress of Trade Unions (SACTU) paper becomes a 30-page quarterly magazine. At South African Congress of Trade Unions (SACTU)'s annual national conference it is agreed to follow the Nigerian initiative and call for the exclusion of South Africa from International Labour Organisation instead of the usual appeal for the United Nations seating of the racist delegates. 7 February, Beginning of International Solidarity Campaign. March, Trade Unions Congress (TUC) in a conference held in East London agrees to change its organisation to Trade Union Congress of South Africa (TUCSA) and open its membership to all bona fide trade unions. 23 March, South African Congress of Trade Unions (SACTU) writes directly to the United States (US) President John F. Kennedy, accusing the US of conducting a full-scale war in South Vietnam. May, South African Congress of Trade Unions (SACTU) promptly writes a letter to Trade Union Congress of South Africa (TUCSA) asking the latter to unite in opposition to the Sabotage Act, pointing out that only broad opposition could prevent its enactment. June, In its continuing sabotage of South African Congress of Trade Unions (SACTU), Trade Union Congress of South Africa (TUCSA) refuses to send an official delegate to the All-In conference against Job Reservation held in Cape Town. International Labour Organization (ILO) voted to expel South Africa. Repression under the 90- and 180-day detentions. South African Congress of Trade Unions (SACTU)'s ninth Annual conference passes a resolution that is subsequently submitted to government stating: (SACTU) is convinced that the Wage Board is used by employers and the government as a smoke-screen to prevent direct negotiations with workers and their trade unions and also as a means to create the false impression that something is being done about poverty wages ... Having noted the Chairman of the Wage Board's statement that non-White workers will have to wait another 15 years before they can get a living wage, Conference calls upon the government to dissolve the Wage Board and forthwith replace it with legislation providing for a national minimum wage and the protection of working standards. An Amendment Act is passed, amid reports of heavy repression and victimisation of South African Congress of Trade Unions (SACTU) and the Congress Alliance. South African Congress of Trade Unions (SACTU) cannot fight the Amendment Act as its leadership is held under a 90-day detention order. Vuyisile Mini is arrested along with two other African National Congress (ANC) militants, Wilson Khayinga and Zinakile Mkaba. NUCW is called on to vote for either South African Congress of Trade Unions (SACTU) or Federation of Free African Trade Unions (FOFATUSA) of South Africa re-affiliation. The old conflict re-emerges as the ballot gives workers the confusing choice of joining SACTU or FOFATUSA-TUCSA, the latter being a non-existent body. Although FOFATUSA receive the greater number of votes, and despite press coverage that trumpets this vote in favour of non-political trade unionism, pro South African Congress of Trade Unions (SACTU) workers refuse to accept the vote and continue to constitute a solid South African Congress of Trade Unions (SACTU) faction within the union. South African Congress of Trade Unions (SACTU)'s eighth conference, the South African Congress of Trade Unions (SACTU) Local Committee organises workers in the garage, motor, brick, quarry and cement, hospital industries and undertakers, into unions. South African Congress of Trade Unions (SACTU) updates the 1962 memorandum with the additional data on repression against its leaders and calls for the expulsion of South Africa. June, In a letter to the High Commissioner for the United Kingdom Protectorates, South African Congress of Trade Unions (SACTU) condemns the use of British troops to smash general workers' strike at Mbabane Swaziland. 5 September, Looksmart Ngudle, Commercial and Distributive workers union, dies in detention. He was the first person to be banned after his death. Curnick Ndlovu, secretary of the Durban branch of South African Congress of Trade Unions (SACTU) is sentenced to 20 years. Having been detained under the 90-day detention order, Caleb Mayekiso is sentenced to 18 months. South African Congress of Trade Unions (SACTU)'s ninth annual conference opens in Johannesburg. 6 November, Wilson Khayinga, Zinakile Mkaba and Vuyisile Mini, organiser of the South African Congress of Trade Unions, are executed in Pretoria Central prison. Viola Hashe is banned and restricted to Roodepoort. Leslie Massina, secretary of African Laundry, Cleaning and Dyeing workers union and member of the Treason Trial, dies in exile. Lawrence Ndzanga dies in detention. 9 January, Lawrence Ndzanga, organiser of South African Railway and Harbour workers union dies in custody. He was detained without trial under the Terrorism Act. Harry Gwala is imprisoned for life, having earlier been sentenced for eight years to Robben Island. 2 August, Elijah Loza dies in detention. John Gaetsewe, General Secretary of South African Congress of Trade Unions (SACTU), in the International Labour Organisation memorandum concludes that secret reports show unequivocally that for capitalist exploitation in South Africa to be preserved apartheid cannot in any fundamental way be changed. November, Joe Morolong, organiser of the Commercial and Distributive workers union, is murdered.